A scene from 2013 Clam Jam: Party goers hop fences to exit Lantern Point after police and security guards told those without the necessary wristband they had to leave. Fairfield University underclassmen, shut out from this year's relocated Clam Jam, have collected more than 600 signatures on an online petition urging the year-end beach blast be open to all students. For years, Clam Jam has been hosted by seniors living at Lantern Point, a shorefront enclave of private homes, and was not sanctioned by the university. This year, working with the students' Beach Resident Advocacy Group, university officials and Fairfield police, Fairfield University will sponsor Clam Jam, which has been moved to the town's Penfield Beach for the first time -- with a series of access and crowd-control rules. The university has limited the number of tickets to Clam Jam -- set for April 25 -- to 1,500, which apparently sold out before freshmen and sophomores had a chance to purchase them. "There are no plans to increase the number of tickets," said Thomas Pellegrino, the university's vice president of student affairs. "The number of tickets and the size of the event is governed by the approval from the Parks and Recreation Department." He said they believe 1,500 is the appropriate crowd size and, "We have worked, alongside students, the Fairfield police and private security to insure a controlled and enjoyable event." Access to Penfield Beach during the event will be limited to those with tickets, and fencing will be erected around the party site to prevent interlopers. "We will have a sizeable police presence in the neighborhood to maintain order," Deputy Police Chief Chris Lyddy said. "There will be no access to anyone without a valid ticket to this event. All of Penfield Beach will be closed for this private event." The undergrads' online petition states: "Clam Jam is a tradition that has previously united all four classes of the Fairfield University community in a day filled with Stag pride." While for several past years Clam Jam was a party that attracted upward of 5,000 people from all over, and filled streets near the beach with students, many of them intoxicated, in recent years steps have been taken to rein in the tradition. A court injunction issued in 2001 helped those efforts, limiting the number of people who can be gathered outside at Lantern Point at one time to 250. With cooperation from the Lantern Point Association, private security was hired for the party and wristbands distributed to seniors living at the point and their guests to limit access. 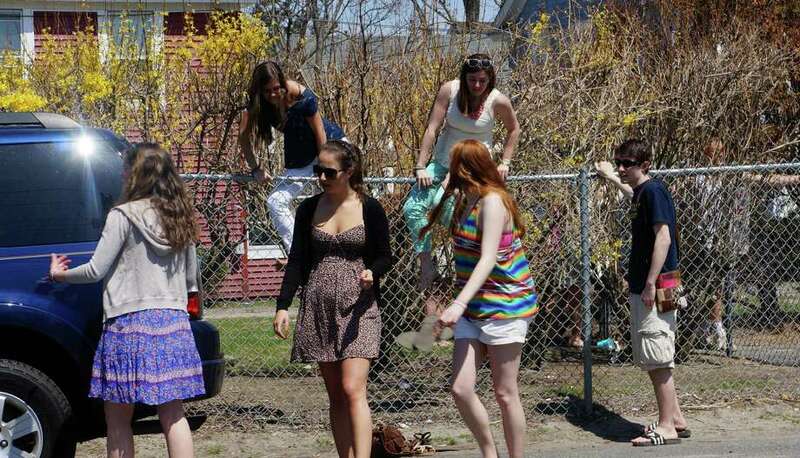 Last year, unable to get into Clam Jam, some students organized a second party at property on Lund Court next door to Lantern Point. But the event was generally far less raucous than some of the parties during the 1980s and '90s, when intoxicated crowds spilled into beach neighborhood streets, triggering arrests and hospitalizations. Students signing this year's petition emphasized what they say is the tradition of Clam Jam for all Fairfield University students, but one wrote: "Open it up or be prepared to deal with the consequences." Those "consequences," according to Jake Hachey, include a drop-off in alumni donations and an increase in student transfers. Hachey wrote, "I'm signing because I have 3 favorite memories from Fairfield. Clam jam freshman, sophomore and junior year. The tradition was stomped into the ground my senior year and I witnessed multiple students mistreated by police." "It is just not right that for the first time in fourty (sic) years, the underclassmen are denied this tradition," Nolan Kislauskis wrote, while Antonio Cortese said, "This is a tradition of which played a major role in my attending of Fairfield University over other schools." And Brenden Hultgren wrote that "to not have the ability to attend such a historic university event that normally supports anywhere from 10,000-20,000 and limit it to 1,500 people is absolutely outrageous."